CHINA: Sinomatech Wind Power Blade has revealed the 77.7-metre blade it has produced for Goldwind's 160/6MW offshore turbine. It is the first product to be developed independently by Sinomatech's blade subsidiary in Funing in East China's Jiangsu province. The blade, believed to be the longest to be built in Asia, weighs 28.8 tonnes and has a swept area of 20,106 square meters. It is made of a mix of carbon fibre and high-modulus glass fibre. The shape of the blade root enhances its performance stability. The blade features a lightning protection system and a differential surface protection system to make it cope better with the offshore environment. Development work started in August 2013 and the product was placed on the test bed on 10 October this year. It passed the static test under the supervision of DNV GL. Sinomatech was set up in June 2007. 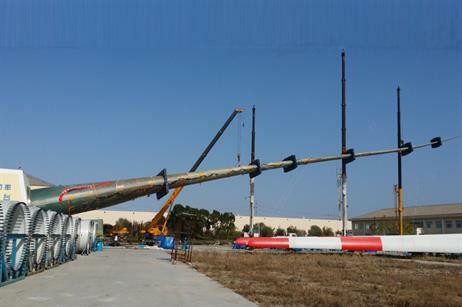 Headquarterd in Beijing, the company controls seven wind blade production bases across China.